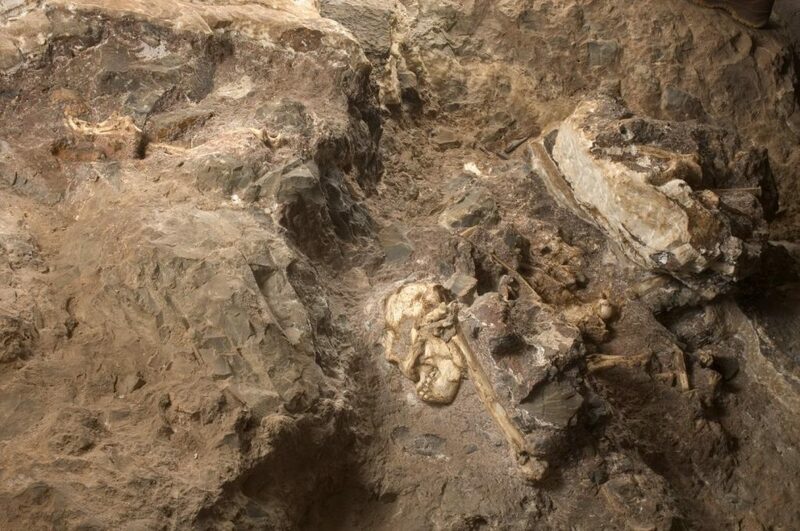 This is a hominin that ended up at the bottom of the Silberberg grotto within the karst system of Sterkfontein, possibly due to a deadly fall from about 20 meters high. There it was buried in a detrital sedimentary rock called breccia, a natural cement. In 1994, the South African paleontologist Ron Clarke discovered four hominin left foot bones in two boxes of fauna remains, which had been recovered from the quarry work at Sterkfontein in 1978. In 1997 Clarke and his assistants Stephen Motsumi and Nkwane Molefe were able to locate more bones embedded in the rock, which corresponded to that individual’s foot at the Member 2 site. Its size led to the nickname Little Foot. For the next 15 years, they were recovering rock fragments with embedded bones, by means of a delicate work using small drills. The rocks were then taken to the laboratory where the bones were separated. Finally, for 5 years the fossils were cleaned and reconstructed. The result is the spectacular skeleton identified as Stw 573, which retains even some articulated parts (left arm and hand) and the complete skull. Lower limb with many modern features. The hand is very big and the arms are long. It shows a combination of both terrestrial and arboreal life. The hand indicates precision grip. A first dating in 1999 by paleomagnetism resulted in 3,3 Ma. A cosmogenic dating by Darryl Granger of the sediments surrounding the skeleton in 2003 gave 4 Ma. In 2002 a new dating showed 2.2 Ma, using uranium series with the collapsed stalactites surrounding the skeleton. In 2014, Laurent Bruxelles, Clarke and others reviewed the stratigraphy, indicating that the stalactites were posterior to the skeleton, and in fact separated parts of it. So Little Foot would have more than 2.2 Ma. In 2014, Granger’s team resumed the cosmogenic dating work, introducing some improvements in the methodology. In 2015 the new dating was published on Nature: 3.67 Ma, very similar to the Laetoli footprints, and even older than Kenyanthropus platyops! Finally, in 2016 Kramers and Dirks proposed a revision of the previous dating to a more recent period c. 2.8 Ma, based on a possible re-deposition of the sediments. Oxygen-16 and silicon-28 are very common in the Earth’s crust. Rocks are occasionally bombarded by cosmic rays which causes microscopic high-energy collisions into the quartz crystals, converting oxygen-16 into beryllium-10 and silicon-28 into aluminium-26. Both these isotopes are radioactive and decay at different rates. If the crystalline material is then buried, aluminum-26 and beryllium-10 are no longer created, and the ratio between the two elements steadily change as they decay. This ratio is a natural measure of the length of the time since the quartz encapsulating the fossil was buried. 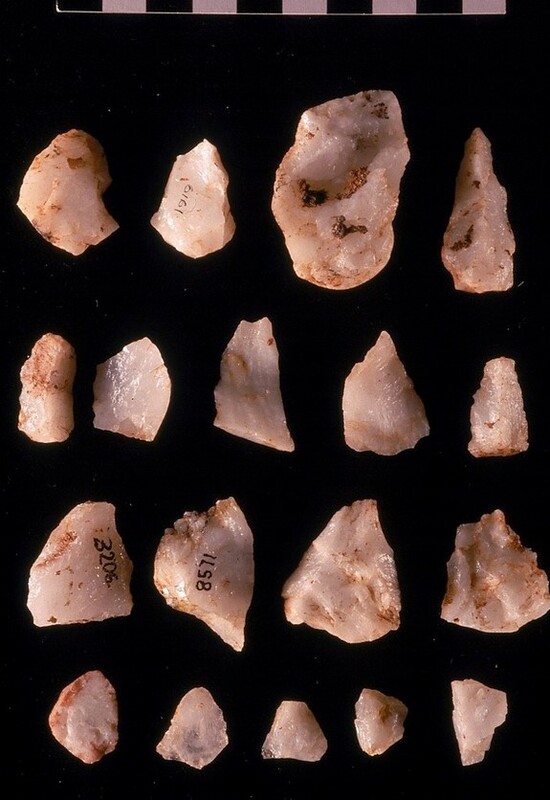 Several Oldowan tools were also found in the cave. They were dated with the same technique at 2.18 Ma. Two species are typically considered for the australopitecines of southern Africa: the gracile species are assigned to Australopithecus africanus and the robust species are assigned to Paranthropus robustus. In either case, these hominins show an enormous morphological variability, very well represented in the skulls and the dentition. 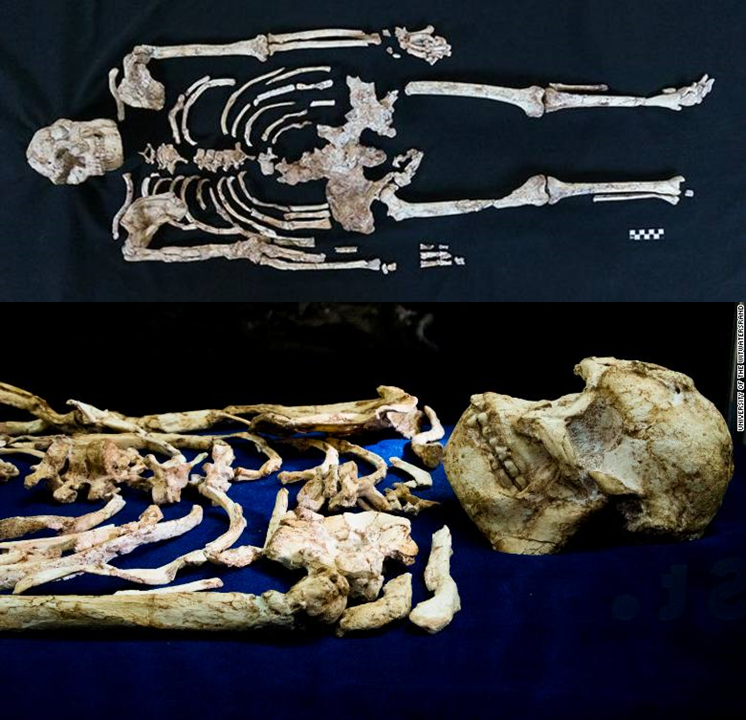 The publication in 2010 of the species Australopithecus sediba, a new australopitecine group from the nearby Malapa site, a bit more recent than afrinacus: 2 Ma (+info on the post Australopithecus sediba: quiénes eran y cómo murieron). Clarke has argued since 2008 that the variability of australopitecine is explained by the existence of a second species of Australopithecus in Sterkfontein Member 4 and Makapansgat with many morphological features similar to those in Paranthropus, rather than relating the variability with sexual dimorphism, individual variation or evolutionary changes. Sterkfontein specimens Stw 252, Sts 71, Stw 505 and several others, and MLD 1 and MLD 2 from Makapansgat would fit into this second species. This species could be Australopithecus prometheus, proposed in 1948 by Raymond Dart for the fossil MLD 1 from Makapansgat, a fragment of the posterior part of a cranial vault. In the Greek mythology Prometheus is the Titan who steals the fire from the gods to give it to his friends, the mortal humans. Dart believed that dark colour of the bones were made by fire, although it was actually the product of the fossilization in manganese-rich sediment (+info on the post La hipótesis de la Segunda Especie en Sterkfontein). In 2013 Clarke proposed the assignment of Stw 573′ Little Foot’ to Australopithecus prometheus, based on its cranial morphology, particularly the occipital region, and the size and characteristics of its teeth, such as the bulbous cusps. Finally, the Little Foot skeleton has been exhibited, together with the announcement of a series of 25 studies to be published soon. We look forward to learning more, especially about its skull and teeth, key elements of the morphology to know its position within our phylogenetic tree. In what context did they live? We only know from other fauna found in the cave, that their habitat was likely a tropical forest. And we will discuss further about the dating. How did the flow of australopitecine from East Africa happen to/from the South around 3.5 to 4 MYA? How did they reach Central Africa, where we have the 3-3.5 Ma mandible at Bahr-el-Ghazal, Chad? (+info on the post What is Australopithecus bahrelgazali?). “The fact that Australopithecus prometheus, Little Foot, is contemporary to an Australopithecus afarensis, Lucy, with very different morphological traits and found in East Africa, now raises new questions about the diversity of the first hominids and their phylogenetic relationships” (Darryl E. Granger). Esta entrada fue publicada en Actualidad y etiquetada Australopithecus. Guarda el enlace permanente. ← ¿Qué es Australopithecus bahrelgazali? Especially in acid corrosive environment.